As well as the headline-grabbing announcements around its new L-mount alliance and S3 camera, Leica also announced a new FOTOS app for its cameras at its Photokina 2018 press conference. Stefan Daniel, Leica's Global Director Product Division Photo revealed the Leica FOTOS app, pitched as 'the gallery in your pocket'. Replacing Leica's separate camera apps, Daniel explained that the single new FOTOS app has been "redesigned from scratch to match the design our customers know and love from our hardware". It will be available for Apple iOS as well as Android. 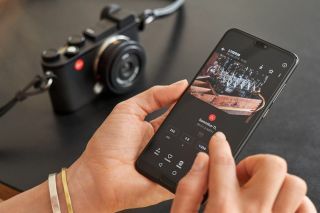 As you'd expect, once connected, the camera and app remember each other forever, the app can be used to control supported Leica cameras remotely, and as well as allowing files to be transferred (DNG and JPG formats), it will allow users to access exposure data, and check sharpness at 100% view. At launch, the Leica FOTOS app will support a batch of Leica cameras, including the S, SL, M10 and the newly announced S3. Support for other models will follow. It will replace a number of different apps that Leica has previously released. Slated for public release on October 24th, a beta-test will go live shortly, allowing Leica owners to test the app ahead of release. Head here to sign up to the beta test of the Leica FOTOS app.